1. What are the priorities of the draft budget for 2019? The 2019 EU budget will allow us to continue boosting Europe's economy while safeguarding security both inside and beyond EU's borders. It is designed to optimise funding for existing programmes as well as new initiatives, striving for European added value in line with the Juncker Commission's priorities. 2. What are commitments and payments? Commitments are the total volume of promises for future payments that can be made in a given year. Commitments must then be honoured with payments, either in the same year or, particularly in the case of multi-annual projects, over the following years. Payments are the actual money paid in a given year from the EU budget to cover commitments. For instance, when the EU decides to co-fund the building of a bridge, the total amount which the EU agrees to cover is a commitment. The bills for the work done are the payments. The commitment is made in year X. The payments from the EU budget may follow in the same year X, but also in year X+1, X+2, X+3. 3. What is the long-term EU budget? The long-term EU budget, also referred to as Multiannual Financial Framework (or 'MFF'), provides a stable framework for implementing the EU's annual budgets. It translates the Union's political priorities into financial terms for a period of several years and sets annual maximum amounts ('ceilings') for EU expenditure as a whole and for the main categories/priorities of expenditure ('headings'). It allows the EU to complement national budgets by funding policies with a European added value. The long-term EU budget provides a framework for financial programming and budgetary discipline by ensuring that EU spending is predictable and stays within the agreed limits. Indeed, the commitments and the payments for a given year need to respect the ceilings for that year set out in the MFF (see the table below). At the same time, it gives certainty to beneficiaries of EU funds, such as small and medium-sized enterprises, regions catching up, students, researchers, farmers or civil society organisations, as well as to national, regional, and local authorities. It also foresees some special instruments which provide some flexibility and allow, if need be, to respond to unforeseen budgetary needs. The current MFF was decided by the European Parliament and the Member States only in December 2013, very late ahead of the start of current 2014-2020 period. On 2 May 2018, the Commission proposed a pragmatic, modern, long-term budget for the 2021-2027 period. 4. Where does the money come from in the current long-term budget? The revenue sources of the EU budget have remained the same over the last decades: customs duties, contributions from the Member States based on value added tax (VAT) and those based on gross national income (GNI). After a gradual decrease of customs duties, the GNI contributions became the predominant source of funding the EU budget (at about 80%, together with VAT-based contributions). The GNI Own Resource finances the part of the budget not covered by other revenues. The same percentage is levied on each Member State's GNI. The rate is fixed as part of the annual budgetary procedure. Some Member States benefit from a reduction. Other sources of revenue include taxes and other deductions from EU staff salaries, bank interest, contributions from non-EU countries to certain programmes, and interest on late payments and fines. As part of it proposal of 2 May 2018 for the long-term budget for the 2021-2027 period, the Commission also proposed to modernise and simplify the current overall financing system and diversify the budget's sources of revenue. 5. What is the relative size of the EU budget? The EU budget has remained a small part of total public expenditure in the EU, accounting for less than 1% of EU income and only around 2% of EU public expenditure. This share has declined over time. This decline has put increased pressure on the EU budget to be more efficient, to focus on the areas where its impact is greatest and to ensure that burdensome rules and procedures do not get in the way of results. The proposed EU budget for 2019 is €166 billion in commitments and €149 billion in payments. 6. How is the EU budget spent? 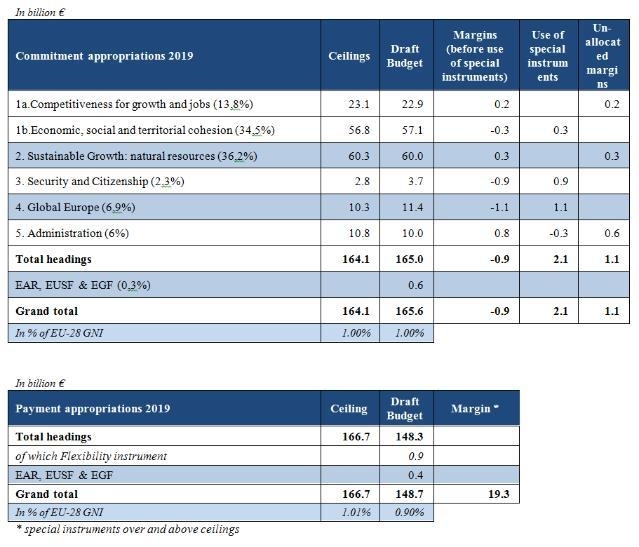 Each year, the amounts for each of the main categories of expenditure ('headings') are set based on the expected needs for the following year and with respect to the long-term budget. Some 94% of the EU budget is spent on projects - in Member States and beyond. The money therefore goes to citizens, regions, cities, farmers, businesses, universities, NGOs and more. The EU budget finances the policies of the European Union, which have a positive impact on the lives of all EU citizens and of many people across the world. It funds areas like employment, regional development, research and education, environment, humanitarian aid and many others (see concrete examples of the programmes and projects). Only around 6% of the budget goes to administration (buildings, equipment, salaries, social security and pensions of all EU Institutions). 7. How is the EU budget managed? About 75% of the EU budget is managed by the authorities in the Member States. The remaining 25% is implemented under direct management (by the Commission) or indirect management (via third parties, such as the European Investment Bank). 8. Why are payments increasing in 2019? The proposed level of payments is €149 billion. This gives an overall increase of +3% compared to the 2018 budget. With regard to the payments for cohesion policy the increase is +1%, reflecting the transition between the past to the current programming period. This is the combined result of the new programmes (2014-2020) which increase by 7% compared to 2018 and the old programmes (2007-2013) that reached the closure stage and do not require important amounts in payments (-45%). This is a sign that implementation of cohesion programmes is progressing. 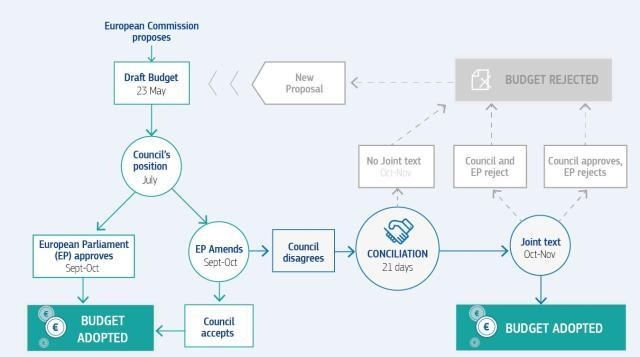 The European Commission now submits the draft 2019 EU budget to the European Parliament and the Council which together take the final decision. The Council usually adopts its position during the summer months and the Parliament expresses its opinion in autumn. A specific Conciliation Committee is usually convened in November to reconcile the positions of the Parliament and the Council. It has to agree within 21 days on a common budget, which both institutions should afterwards approve. This year, the period runs between 30 October and 19 November. 10. What is the link between the Draft EU Budget 2019 and the new long-term EU budget? managing migration, both internally and externally. While the EU long-term budget was able to adapt to these new challenges, tackling them required innovative solutions and many changes in existing programmes and even a change of the financial framework provisions at mid-term to increase flexibility. By now, the scope of flexibility under the current 2014-2020 long-term EU budget have been practically exhausted in order to enhance investments (EFSI) and jobs, and respond to the migration and security challenges. to reinforce the programmes that are key to EU's competitiveness (Research and Innovation, Connecting Europe Facility and Erasmus+) and the financing related to border management, migration and security. For Research and Innovation €115 billion are proposed while for border management the new EU long-term budget proposes more than €35 billion compared to €13 billion for the current period. to enhance flexibility, particularly by providing extra flexibility between headings and years. 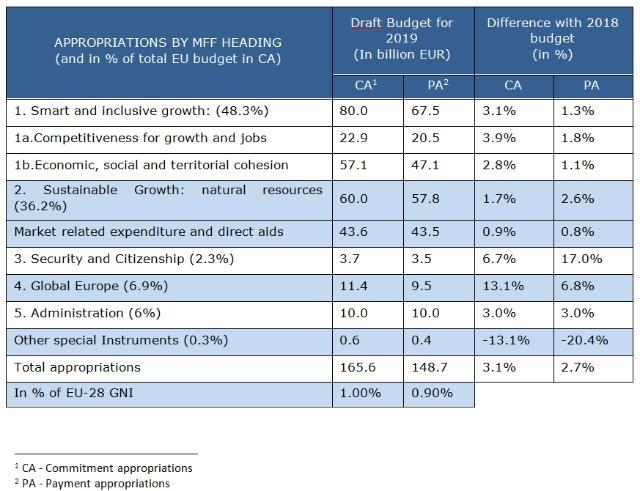 The increases proposed in the Draft EU Budget 2019 are in line with the orientations of the proposed new long-term EU budget: increases for defence, migration, Horizon 2020 and Erasmus+. For example, the Daft EU Budget 2019 proposes the phasing-in of the new programme for the European Defence Industrial Development programme with €245 million (building on the Preparatory Action on Defence Research started in 2018) which paves the way for the new European Defence Fund with €13 billion for 2021-27.